The late, legendary coach Dean Smith is often credited as the originator of the 4-corners delay offense at North Carolina years ago. Actually, it was former North Carolina College coach John McClendon who first authored it in the 1940's - early 50's. 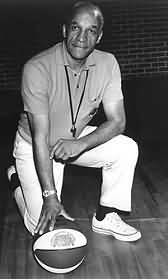 This less well-known coach also pioneered basketball's full court game, the full court press, the full court zone (zone press), the open post offense whose variants include the "four corners", the rotating pivot, and the double-pivot. Coach Smith made it popular at the University of North Carolina and the Tarheels delay offense so dominated the tempo of the game that the NCAA subsequently created the shot clock rule. High school teams that are not affected by a shot clock rule could employ this offensive half-court set when wanting to take time off the clock. Teams can also use it when going for a last shot, or when wanting to go for only a good, high percentage shot. Also, if you have the lead and the opponent changes to zone defense, this can also be a counter strategy to get the zone defense to come out and play man-to-man. You can hold the ball until they come out of their zone. For those of you who run the Flex offense, you might prefer to run the "High-Flex Delay Offense" as your delay offense. See the diagram. We use a basic "4-corner" setup with O2, O4, O3 and O5 on the corners, and the point guard O1 is free to dribble, move around and cut inside the four corners. Have your best ball-handlers and free-throw shooters on the court. The point guard, or "chaser", O1 can dribble-penetrate the middle of the box, but as he/she picks up a defender, or the double team comes, should quickly dish the ball off to one of the four corner players. The corner player can just hold the ball until challenged by a defender, or pass to another corner player, or back to the point guard. All passes must be crisp and accurate and high percentage. Do not throw across court into traffic, where it could be intercepted and taken for the game-winning lay-up on the other end. If O1 gets the double-team in the middle, he/she can pass back outside (to where the trapping defender came). Diagram A2 shows the trap coming from X2. O1 passes out to O2. O1 clears to the sideline (and then to the high right corner), as O2 dribbles middle once he/she is defended. Diagram A3 shows the double team comes from X3, so O2 passes out to O3 and clears to the left sideline, and fills the top left corner. When you pass, fake a pass one way, and pass another. You can look the defender off to open the passing lane. If you are in trouble with a double-team, or can't find someone to pass to, call a time-out (but you must know if you have any time-outs left, otherwise it's a technical foul on you). If O2, O4, O3 and O5 are being guarded closely and being denied the ball, O2 and O4 can screen and replace each other, and so can O3 and O5. Here's a tip that works sometimes for an easy lay-up. The point guard dribble-penetrates the middle to the circle, but then pops back out with a pass to a corner. He/she gets the ball back and does this a couple more times. Now the defense is expecting this pass back out the next time, so they over-play for the pass... but this time the point guard makes the hesitation move and then the quick drive to the hoop for the easy lay-up. But it doesn't always work out like this, so if the defender challenges the point guard's lay-up, O1 should just dribble it back out or get it out to a corner... remember, only uncontested, easy lay-ups. When dribbling, pass before the double-team arrives. Avoid the 5-second violation. Then, after passing, cut and get open to receive the pass back immediately. If denied the pass back, then either make a basket cut to the hoop, or replace either O2 or O3 in the corner. B. Rules for the wings (O2 and O3). Stay in the corners, about 6 feet from the sideline and the half-court line. After receiving the pass, if not pressured, hold the ball until the defense comes and pass back to O1. If the pass to O1 is being denied, dribble inside and become the new "chaser" and replace O1 who goes to the vacated corner. C. Rules for the posts (O4 and O5). If the pass goes to a baseline corner, the weakside post flashes to the ball-side low block. In diagram B, the pass goes to O4 in the right corner and O5 flashes to the ballside block. If a post player's defender (here X5) goes to trap the chaser (O1), then cut to the basket (diagram C). If the chaser or a wing is in trouble or stops the dribble, cut up the sideline to the free-throw line extended level to receive the pass (diagram D). If the post defender over-plays and denies this pass, then back-cut to the hoop (diagram E). Situation 1, we have a small lead with only a minute to go in the game. In this situation the only acceptable shots that are permitted are the uncontested lay-up and free-throws. At this point in the game, the concept that is very important for everyone to understand is (to quote the late Coach Al McGuire of Marquette): "The clock is your enemy!". We have the lead and don't need any more points or shots. We just have to keep the ball out of the hands of the opponent so they can't score, as we run time off the clock. So then, you ask, why even shoot the uncontested lay-up, because we could miss it and the opponent could get another possession. Here's my thinking. I would shoot the uncontested lay-up because it's a 90 percent shot, and it can put the "last nail in the coffin" for the opponent. Just trying to run the 4-corner offense and taking time off the clock is not always a guarantee that we won't make a turnover, or that the defense won't steal the ball. Also, they will foul us, and I would rather have an uncontested lay-up than a 1-and-1, high-pressure free throw. It's all how you play the odds, and the uncontested lay-up is a good bet. Coaches, this is the time to have your best ball-handlers and best free-throw shooters in the game. Situation 2, we are going for the last shot of a quarter. You can also use the 4-corner offense to stall the clock for the last shot of a quarter. When the coach yells "Go" (usually about 10 seconds left), then the corners move in and you start working to get a good shot off. If the shot is taken with about 4-5 seconds left in the period, it may give you time for a quick rebound and a second shot, but not enough time for the opponent to take it all the way down and get a shot. But don't foul going for the rebound, especially if the free-throw bonus is on. A common error that I see many teams make, even college and professional teams, is that they wait too long to get "into the offense" and end up taking a bad, wild long-outside shot, or no shot at all. You should be moving in and looking to score at about the 10 second mark, with the shot going up at about 4 seconds. Even if you score a little "early", you should be able to play good defense for 5 seconds! Situation 3, it’s near the end of the game but we’re not quite ready to go into a full delay. We may be up by 8 points with 5 or 6 minutes left in the game. We do not want to go into a full delay and lose sight of continuing to score. But we would like to be patient and run some time off the clock. We may go into the 4-corners offense, but still looking for a good, high-percentage shot, or a chance to go to the free-throw line. The defense may think we are in a full-delay, and when they least expect it, we will attack the basket for a lay-up. If the quick lay-up is there, we'll take it. This is also a good strategy when we have the lead, and the defense is sitting back in a 2-3 zone preventing our inside game and guard penetration. Bringing the ball out in this 4-corners offense will force the defense to come out of their zone and play man-to-man, now opening up the middle for our inside game. If you are dealing with a shot-clock however, you can only run this offense for a little while. Also see the "High-Flex Delay Offense"... for those of you who run the Flex offense, you might prefer just to run the High-Flex as your delay offense. Here's a helpful DVD and a book from the master himself, legendary coach Dean Smith. An excellent book with sections on the free-lance passing offense, 1-4 offense, "T-game", basic cut-movement game, 4-corners offense, fast break offense, press-breakers, special situations and the shuffle offense. Defenses include pressure man defense, the run and jump defense, the "40"and the "50" defenses.